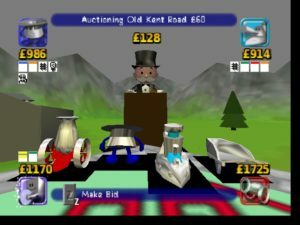 Monopoly is probably the world’s most popular board game (put your hand down, Chess, nobody likes you), and as such, has been ported to just about every video game system you can think of, much to the delight of those without the friends or the time to bust the board out and get an actual game going. So, it was no particular surprise to see it show up in the N64 lineup just in time for the new millennium. The question then becomes, is there any reason to track this particular version down? I can’t pass up the opportunity to be a slum lord. Well, yes and no. 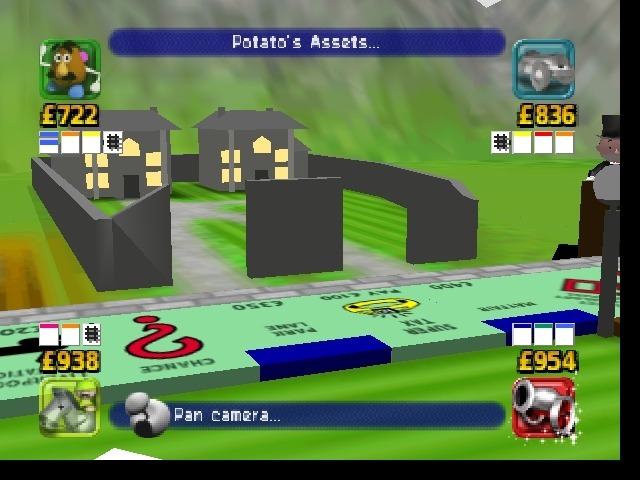 It’s still Monopoly, but it’s presented this time around in a much more cartoonish manner than say, the NES or Super Nintendo versions. The game pieces are anthropomorphic creatures, circling a massive board under the watchful eye of a giant Uncle Pennybags, moving around at the whims of enormous dice that fly through the air and crash down to earth. The pieces all have a distinct movement style, as well; the car chugs along and skids around corners, while the thimble waddles around on feet directly connected to its body, for example. There’s also a few neat little quirks to be found, like the Go to Jail square catapulting your piece through the air and into the clink, and each color area has some adjacent buildings befitting its value, so Baltic and Mediterranean are raggedy shacks, while Park Place and Boardwalk are gated estates. There are plenty of options to be found here, which adds replay value. 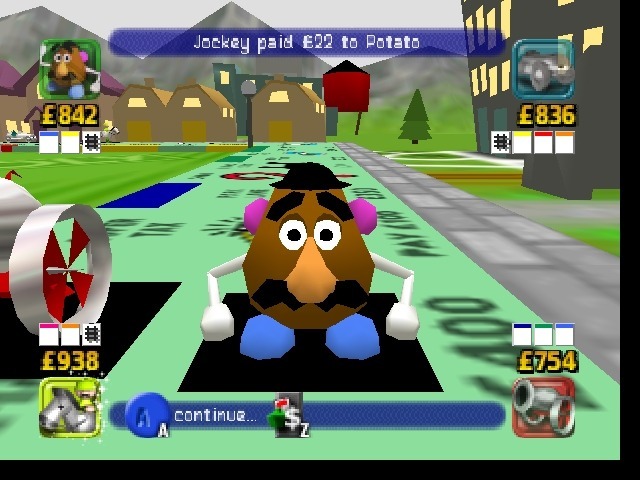 Aside from the standard version for up to 4 players, there’s a Short Game, which is kind of like a sudden death mode where the game goes until one player goes bankrupt, and then the player with the most assets is named the winner, and a Timed Game, with time limits between 15 minutes and an hour, where again, whoever has the biggest nest egg at the end wins. There’s also a decent selection of rules options to spice things up, from being able to turn off the even build rule, to giving players that land on GO 400 dollars instead of 200, all the way to forcing players to make a trip around the board before being able to buy anything. 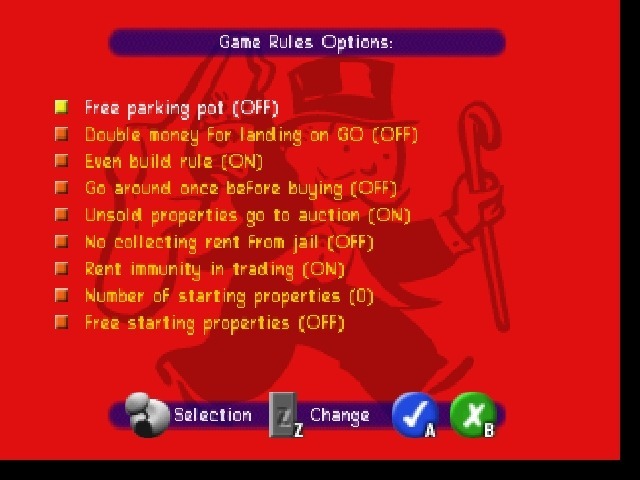 However, maybe the most interesting option can be found before you start the game: if you hold Start while turning the game, you can choose between the American and British versions of Monopoly, and while the only real differences between the two are cosmetic, it’s definitely a cool feature that I haven’t seen in other versions, and somehow it feels more high class to receive a “bank error in my favour”. Controls are pretty easy to figure out, even if you don’t have a manual handy, as most everything has a button next to an illustration of the action, like rolling the dice having a picture of the A button next to a picture of the dice. Between turns is the only time you can save, which can lead to some mild frustration from hitting A one too many times and having to sit through someone else’s turn. Pressing Z between turns brings up the trading screen, which helpfully zooms out to an overview of the board, and by holding R, all owned properties turn the colors of their respective owners, which helps to see exactly who owns what or what spaces remain unclaimed. If you know where to look, you can find Mr. Potato Head. The actual act of putting a trade together, though, can be a bit sticky, though, as unlike the NES or SNES versions, there’s no way to request a property and leave your side of the trade block blank as a “what do you want for this?” sort of question, instead, you’ll just get turned down as if you actually were expecting something for nothing. 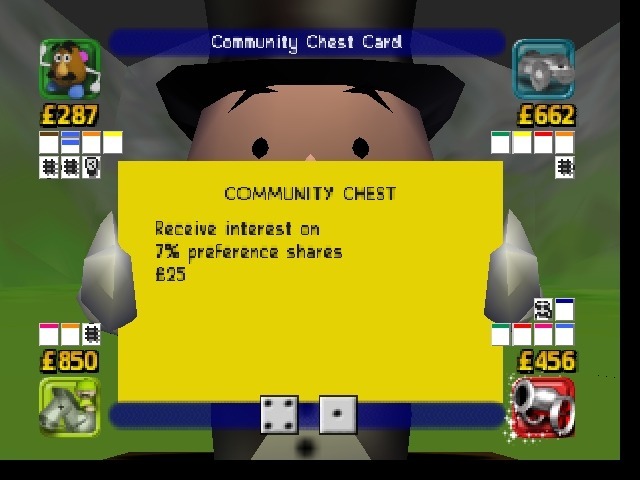 More annoyingly, if you happen to have the last piece of someone else’s trifecta, especially late in the game, be prepared to be offered a trade for it just about every turn, and oftentimes, it’s never a particularly even trade; a player with Boardwalk who wants your Park Place will offer you Electric Company and two-thirds of a color group you don’t have the third piece of, and maybe a hundred dollars, if they’re feeling generous, and they never seem to learn that you’re not interested. Speaking of which, when playing against computer opponents, you allegedly have four different personality types to choose from, Cautious, Bold, Normal, and Intelligent. As far as I could tell, though, there didn’t seem to be any discernible difference between the types, and much like the different opponents on the NES version, I think it’s little more than window dressing, and only seems to affect how high of an invisible bar you need to clear to get them to accept trades, like paying 250 dollars to buy a property outright from someone as opposed to 200, and no matter what personality an opponent has, they’re all still susceptible to the same kinds of exploits; I can’t tell you how many times I managed to engineer really favorable trades by finagling the last piece of a color group from one player and then immediately turning around and shopping it to the player who actually needed it. Granted, it’s a lot to ask for a 1999 N64 game to learn a human player’s tendencies, but you would think the toughest opponents a game can muster could see the Screwjob Express coming after the first dozen times you get away with it, and if you have the rule that makes unsold properties go to auction, you can REALLY cripple opponents, as I’ve witnessed plenty of instances where the computer would happily clean out their entire bank account to snag Boardwalk, even if it meant having to mortgage damn near everything else they had to make up the difference. This is perhaps the most British Community Chest card imaginable. Aside from the exploitable A.I., I do have some other minor complaints. I hope you know the rules of the game before you pop this in, because there’s no rulebook or tutorial to be found here, and while it’s assumed you know how to play already, well, since you’re playing the game, that would’ve been nice to have. Also, the animations of pieces going around the board are unskippable, and even if you turn them off on the menu screen, you only really replace them with animations of pieces falling into a hole and popping out on the other side, which can be just as annoying for some, if not moreso. You can only play with up to 4 players, which makes sense given that any more would kinda make the game stretch longer than necessary, but not every family has four or fewer people in it, and that seems like the demographic for a game like this. 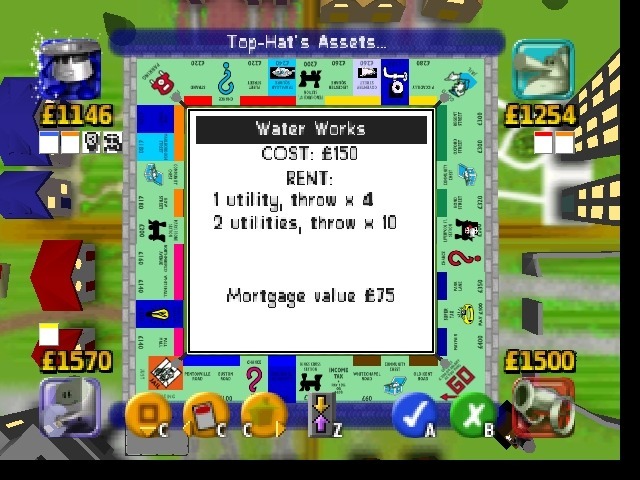 All in all, Monopoly for N64 is a very solid, very playable version of the timeless board game. The whimsical, almost Disney-esque approach is rather unique, at least for the time, and the rules options, game modes, and the inclusion of British Monopoly give it a longer shelf life than you’d probably expect. The A.I. has its faults, and the presentation might wear on some people after a while, but on the whole, I feel that you could pop this in on a rainy weekend with some friends and family and have an enjoyable time, and that’s all you can ask. Plenty of options, two boards, and different game modes provide good value, and the Pixar-ish style is fairly unique. The cartoon-inspired approach may wear thin sooner rather than later, A.I. leaves something to be desired.